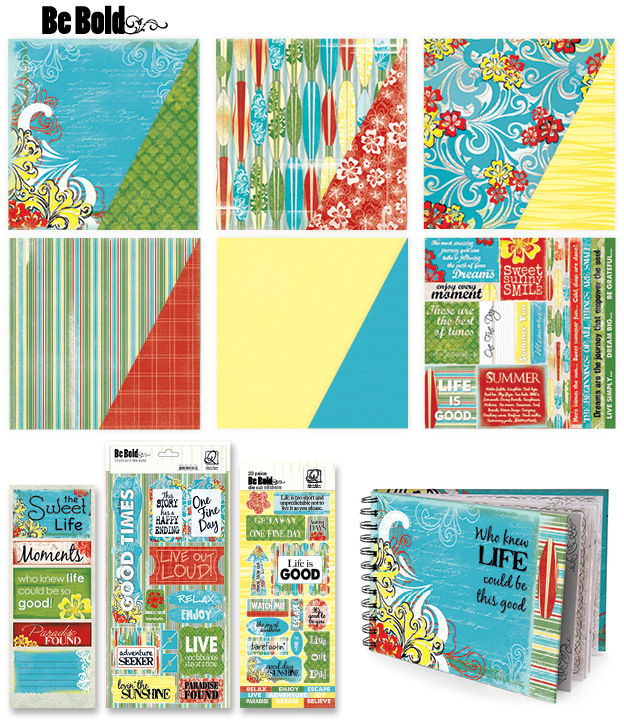 Blog Quick Quotes: 2013 Releases - "Be Bold" Collection! 2013 Releases - "Be Bold" Collection! We are so excited to introduce to you the all new "Be Bold" collection! This collection is filled with brilliant colors influenced by the beauty of a tropical vacation. Bold patterns and fun illustrations just perfect for all of those lively photos. OH yeah! Love brights, and this collection is completely appealing to me. I am liking the quotes for this collection. Also, the bold, bright, fun colors! I love the colors, it makes me think of summer! It is rainy and dreary here today, so this is just what I need! Nice! Looks like a great choice for summer and travel. Hmmmm, going on a cruise in February. Should this be the paper line to scrap it with!! Love this!! The colors are so bright and cheerful! Perfect for preserving those vacation memories! I definitely love the BOLD colors, agreat combination of colors too. How pretty. I like the bright, cheerful colors. Perfect expression of summer! Congratulations. what a fabulous next step . Great colors, Super Design and that Mini Album has mY NAME on it!!! LOVE this collection. (All of it, but especially the mini album!) I could really BOLDLY craft what no one has crafted before with this fun stuff! Funny, one of the comments I left yesterday (I think on FB) mentioned how this is my absolute fave of the new releases. I love the bold bright colours and the aqua is stunning! I think it is perfect for a summer vacation album, for any kind of happy card, for birthday parties - both decor and cards / LOs, not to mention tropical vacations... As soon as I saw it I knew I wanted every bit of it! Love the new colors. In the middle of the winter, it is fun to see the brightness! This collection makes me happy with all the bright sunny colors! I am heading to Hawaii soon and I am so using this line when I get back. Love the bright colors-it has me dreaming of summer weather! So bright and cheery. I could see using this for Birthday layouts! Bold colors. I would love to see what your design team's ideas for this paper line. Wow these colors make me want to go to the beach. Love the bright colors, it would be perfect for my kids pictures of a week at the beach! Wonderful for vacation projects. I love this collection. QQ does it again! What a happy collection of colors. I really like the cover design of the mini book. Really, really like these bold colors !!! Great line ! love that mini-album too. The bold colors in the Be Bold bundle is like a bright sunny day.... makes you feel happy and blessed to enjoy another beautiful day! I like these colors. I love the colors of the "Be Bold" collection, and I can't wait to get my hands on the embellies! I love the bright colors of this collection and the album too!